It turns out that the IEEE recently approved a new ethernet standard: IEEE P802.3bz. This new standard, called NBASE-T, defines 2.5 Gbps and 5 Gbps ethernet – using existing Category 5E or (preferably) Category 6 cabling. That’s much faster than your current 1Gbps network. 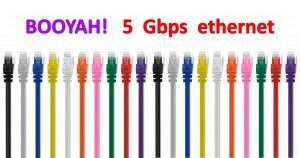 You DO have gigabit ethernet, right?? So, if you’ve got Cat 6 cable run through the walls of your house, rejoice! That existing cable will work beautifully with the new standards. 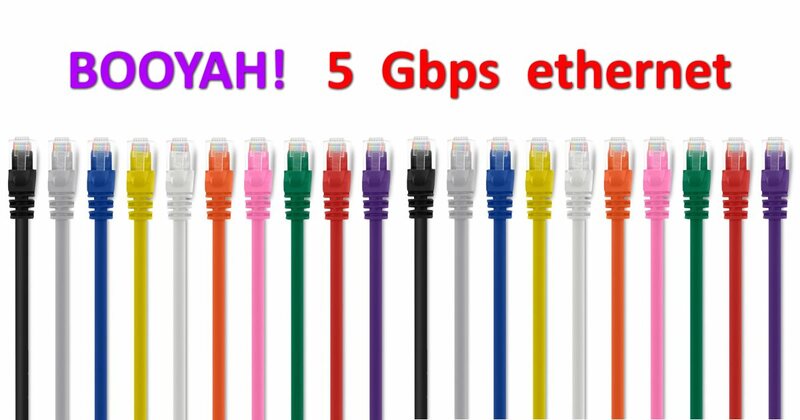 All that’s needed is replacing the ethernet switches you have connected up around the house in order to upgrade from 1Gbps to 2.5 or even 5 Gbps. Well, I’m sure you’ll also need to buy a new puter that supports more than “just” gigabit ethernet. Or, perhaps a USB3 ethernet dongle will suffice? Everyone knows that the most annoying and time-consuming part of upgrading your (wired) home network is replacing all the cabling. As for WiFi, you can now get faster than 1Gbps speeds… if you manage to connect to your WiFi gizmo’s radios on 2 different frequencies, which is no small task. As far as I’m concerned, they can keep their microwave emitters to themselves. I like my local network wired, fast, and reliable. And in the very near future, that network will increase in speed by up to 5 times.